*This is a fictional story that Amie wrote for her eighth grade English class this semester. I thought it was fabulous! All along they'd planned on a boy. She honestly had no opinion, a child was a child, and she would love them no matter what. But her husband did, and made it blatantly clear. "They're good luck," her husband said, “He’ll take care of us in our old age. Girls are too weak". The doctor entered the room, grim features plastered onto his face, carrying a tiny infant, hers. She remembered him taking the child, saying it needed immediate attention. And now, he was back. “Is it a boy? Please tell me it is…” She whispered. He stared at her with… Could that be pity? The blood rushed through her ears. The world seemed to crash down around her. She sat back, stunned into silence. What would her husband say? What would he do to the baby? What would he do to her? She gathered her thoughts. It was a late summer night, a bite in the chilly "almost-autumn" air. However, to her, it seemed as though an icy steel hand was gripping her fast-beating heart. She was torn between terror and despair, all because of the basket she was cradling in her arms. As she stepped from the dim alley, her midnight-black hair created a dark shadow over her face, masking the fear, the sorrow, within the otherwise beautiful eyes. The city was usually a welcoming sight, with all it’s twinkling lights. However, tonight, it seemed chilly and forbidding. The twinkling lights mocked her as she scuttled towards the gate, still clutching the basket, thinking of what she was about to do. She'd begged her husband the day before, pleaded to let the precious contents of this basket stay. But no, "it", he said, must go. Nothing she said would change his mind. He’d even threatened to kick her out too. She continued her brisk pace towards the steps. "It", he'd said, as if “it” was just a worn hat, or perhaps a piece of parchment, something that could easily be thrown away or replaced. Not as if this was a child, her daughter, only three weeks old. She choked back a sob as she reached the gate of the orphanage at last. Pain seared through her heart, driving sorrow into the deepest crevices of her very soul. She laid the basket down at the worn step, gazing down at her peacefully sleeping infant, taking in for the last time her tiny button nose, the way she breathed so lightly as she slumbered, her beautiful chocolate eyes, with long, black, fluttering lashes, picturing the way her eyes sparkled with innocence and mischief upon waking. She stared at her plump cheeks, her rosebud lips, miniatures of her own, imagining the half moon smile that shone on her face, and wondering if it would ever light her child's face again. As she crouched over her daughters basket and unclasped the necklace from around her neck, her opaque hair fell in a veil around her neck, shielding her fast-falling tears. As she made to lay the necklace in the basket and stand, she realized the baby had grabbed a fist-full of her hair. She bent back down, and brushed her lips against her daughter's minute ones. She then gently pried her daughter's fingers from her hair, with a small prick leaving one piece in her baby’s hand, replacing it with the necklace that had been passed down through generations of her family. The ornate gold chain and lilac gems complimented her petite features, just as they had for many others throughout hundreds of years of her ancestors.Yet her baby would never know this. She’d never know the joy of having a family. She was fully sobbing now, tears shining on her face in the once dreamy full moon's light. She rose once more, and as she turned to leave, to walk back home in woefully painful shame, she whispered for the last time through the night, "Wo ai ni." I love you. By the time she got back to her humble home, the gentle light of dawn was beginning to spread its fingers through the darkness. Her tears had long since dried, she was determined to be strong. But when she turned the corner, as a strong breeze blew, she saw hundreds of cherry blossom petals floating through the breeze. They were everywhere. Carpeting the hard packed dirt road, swirling, twirling, and dancing in the wind. It was a sea of pale pink, and she felt like she was drowning. They gently touched the ground, like a thousand soft kisses. As she stared around her in awe, the tears began to flow again. The flowers… It was a cruelly ironic scene, how she was drowning in the blossoms that reminded her so much of her child. As the petals touched her shoulder, she brushed them off. When they floated to the ground, it was as though the earth were crying with her. Weeping a thousand tears for her precious angel, Hua. She stared out the dirty window, a tear tracing a track down though the dust. She was the picture of modest beauty, a long dark braid weaving down her back, and petite features. A layer of dirt masked her pretty features. She was dressed in a dirt brown dress, the color of a moldy potato, and the room she’d spent her whole life in didn’t look much better. The spoiled-milk colored walls were peeling, and the floor was dirty. Down at the street below, people bustled along, laughing and chatting with their friends and family. Family. The word was so foreign to her. She didn’t remember her family, just this sadness, this pain, this loneliness. All she’d ever known. If she dug back deep enough, she could remember a tear touching her face, a kiss, and then… darkness. And that was all it's been since. Years of waiting and watching, lying, and forcing the puzzle pieces into place had paid off- Hua was alive and healthy, a beautiful young woman. She’d spent the last eight years watching at the orphanage, playing the role of a caring nanny. Nothing more. Just a kind caretaker, perhaps more interested in the well-being of the children than most, but still, there was no special bond between her and Hua. Or at least, none that Hua knew of. But today she knew she had to tell her the truth and come clean about her past. Hua was laying on the edge of the old metal cot, counting the number of mold spots on the ceiling tiles. She heard a noise at the door, and one of the nannies entered. She didn’t really have any strong affection for any of them, but this one seemed… different. She had a gentle tone about her, kinder than the others, more caring towards the children. She came over and sat on the edge of the bed. She Wanted to Play the Guitar! Because of her limb difference, Julia can either strum or play chords on a guitar, but she can't do both at the same time, and this girl likes to rock and roll! So we took a little trip to Shriner's Hospital and talked to a prosthetist. She was very enthusiastic about developing a device for Julia that would help her to hold a pick with her left hand! Julia was a little scared because this was a new experience, but it didn't take long before she was smiling and asking questions again. First the prosthetist measured Julia's arm. Then Julia got to pick out her design. She chose blue marble. Now it was time to start making her device. Her arm was covered in a couple socks, and then it was wrapped in "mud", which didn't look or feel like mud at all. It was a roll of sticky white stuff that hardened after it was applied. This part didn't hurt at all! Now the prosthetist marked different places on the form to show where Julia's bones were and where her arm bent. Once the form was hardened, it came right off! Now all we had to do was go home and let the prosthetist work her magic. A couple weeks later, we returned to Shriner's to pick up her device. First, a sock was put on her arm and then a silicone-like sleeve was used to hold the device in place. It had to be adjusted just a little bit to make sure that it fit perfectly. Then Dad gave a few quick pointers. 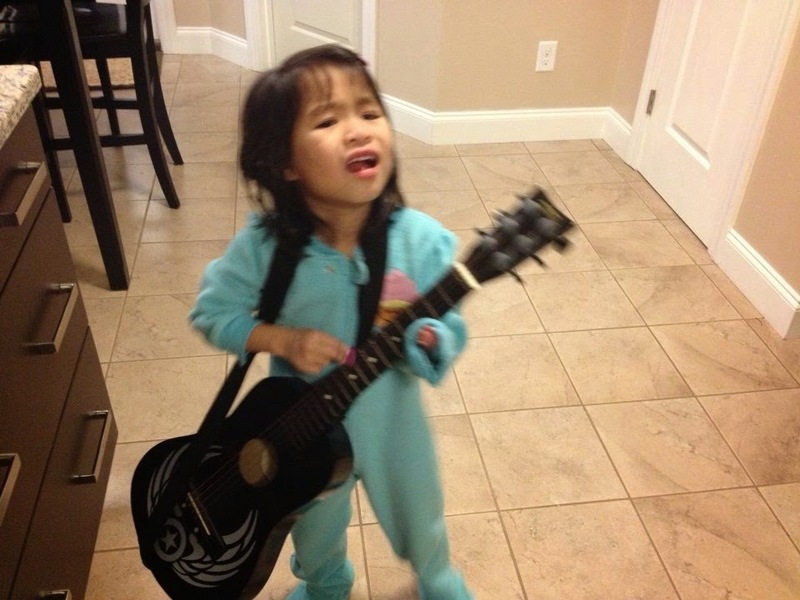 We have a ROCK STAR in the making! I mentally started this post about a month ago, and in my mind the title was, "Never Underestimate the Value of a Mom." My premise was going to be that even though we moms are great at knowing what we're not so good at, our children see past all that and love us unconditionally. You see, my daughter had gotten into an unintentional habit of looking up at me multiple times a day and saying the words, "I'm so glad I have a mommy and daddy!" Every. Single. Day. She said those words with the most serene, happy look on her face, and she would usually be holding my hand, so she would snug up on my arm and melt into me. What a treasure! What a treat to hear those words even when I had made mistakes or mishandled situations earlier in the day. When we were playing together or taking a walk, just spending time together, inevitably she would look up at me with her dark brown eyes and speak her happiness into my heart. "I'm so glad to have a mommy and daddy!" "This is the message that has to get out there," I thought. "Kids need moms, even moms who don't feel like they have it all together. I certainly don't, and my daughter doesn't even seem to notice. She's just happy to feel loved and belong." That was the post I was going to write, and if I was lucky, it may have even included a picture of Julia's face as she smiled up at me in that moment just before the words poured out of her mouth. But I got busy, and the blog took a backseat to working with my husband to build a playset in the backyard and then to planning the big birthday party for a certain little girl. And my post never got written. Why not write in now? The party was last weekend. Everything is cleaned up and put away. Thank you notes are written. Everyone's in school, and I've got a quiet house. Well, about that. Um, a couple days ago my daughter said that she wanted another family. She even named one of her friends and thought that her family might be a better fit. Ouch! And the more I thought about it, the more I realized that I had gotten completely caught up in doing things for her and had neglected to do things with her. For about a week and a half, my priorities were focused on getting things done, and my sweet little girl who was so happy to have a mommy and daddy was pushed to the side. A child needs to know that they're precious and valuable, and one of the best ways to convey this message is to just be with them. So the next morning when Julia woke up, I scooped her up and rocked her back and forth, looking into her eyes and telling her how precious she was. We held hands walking out to the car when it was time to go to school. After school, we played in the backyard together and planted some flowers.Over the next several days, as I became more intentional, her attention-seeking behaviors lessened, which was a win-win for us all! Yesterday we were playing dolls in her room when she stopped and looked me straight in the eye. I saw the expression on her face before I heard the words, and I knew what was coming. "I'm so happy to have a mommy and daddy!" There is an Ancient Chinese Proverb that says, "An invisible red thread connects those who are destined to meet, regardless of time, place, or circumstance. The thread may stretch or tangle but will never break."